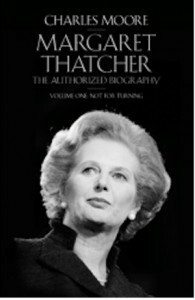 Penguin Canada has confirmed its Allen Lane imprint will handle Canadian distribution of the authorized biography of Margaret Thatcher. Following the death of the former U.K. prime minister on Monday, Penguin U.K. imprint Allen Lane announced it will publish Margaret Thatcher: The Authorized Biography, Volume One: Not for Turning on April 23. The Canadian release is slated for April 30. In an official announcement, Penguin U.K. states that Moore was given full access to Thatcher’s private papers and interviewed her extensively. Moore was also able to speak freely to former and existing civil servants, and was given access to government papers normally held back from public view. Thatcher did not read the manuscript before her death. Covering the years up to 1982, Not for Turning precedes a second and final volume, Herself Alone, which Moore is currently completing. The biography will be published in the U.S. by Alfred A. Knopf.